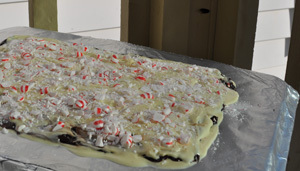 Yesterday Skoogie and I made Peppermint Bark. It has become one of our holiday favorites and makes a great teacher treat! This year, Skoogie not only counted out all the chocolate squares, she was a NATURAL at pounding the candy canes with our rubber mallet and then sprinkled the peppermint pieces on top... but best of all she loved sampling our teacher surprise! The recipe is adapted from Bon Appétit. 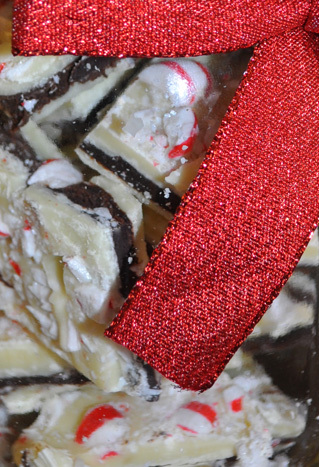 For our version, we use candy canes since they break easily, increase the amount of white chocolate to allow for full coverage on the top-layer as well as the overall ingredient quantity to allow for more gift giving. We packed the peppermint bark in mason jars, cut out a message tag from recycled holiday cards to fit the round lid and then tied a bow on the neck of the jar for a fun gift! This year we added fresh cut rosemary for added edible decoration. The recipe allows for 8 half-quart mason jars (or a combination of some smaller or larger jars). Turn two large baking sheets upside down, and cover them with heavy duty non-stick aluminum foil. Mark a 9- by 12-inch rectangle on each. Put the white chocolate in a metal bowl, and set it over a saucepan of barely simmering water. (Do not allow the bottom of the bowl to touch the water. A double boiler works great.) Stir occasionally until the chocolate is melted and smooth. Remove the chocolate from the heat. Pour 3/4 cup of white chocolate on each rectangle. Using a rubber spatula, spread the chocolate to fill the rectangles. Sprinkle each tray with ¼ cup of the crushed candy canes. Chill until set, about 15 minutes… or if you live in a cold climate set outside for 10 minutes! Meanwhile, combine the bittersweet chocolate, cream, and peppermint extract in a heavy medium saucepan. Warm over medium-low heat, stirring frequently, until the mixture is just melted and smooth. Cool about 5 minutes. Then pour half of the bittersweet chocolate mixture over each of the white chocolate rectangles. Using a clean rubber spatula, evenly spread the bittersweet chocolate. Chill until very cold and firm, about 25 minutes (shorter if outside on a cold day!). Rewarm the remaining white chocolate. Working quickly, pour half of the white chocolate on each tray and spread with a clean rubber spatula. Sprinkle with remaining crushed candy canes. If the white chocolate sets too quickly, after sprinkling on candy canes, set the cookie sheet in a 200 degrees oven for a few minutes. Remove and press down the candy to set in place. Chill until firm, about 15-20 minutes. Carefully lift the bark from the non-stick foil and place on a large cutting board. Trim away the edges and then cut the bark into columns. Cut the columns into different size shapes and pieces for little nibbles or BIG BITES!